Acrostic definition: An acrostic is a type of poem that uses the letters of other words to form a word itself. An acrostic is a type poem. When the words in the poem are arranged in a particular format, a new word is created. The words that make the acrostic poem are written and read horizontally. The new word that the acrostic poem creates is read vertically. There are several ways that a writer could choose to structure an acrostic poem. The three most common acrostic examples are with the word order taking place at the beginning, middle, and end of each stanza. When a writer chooses the word order at the beginning of the lines of the poem, it means that he will use the first letter of each word to create a new word for the acrostic poem. The following examples shows the new word “snake” created form the first letters of the acrostic. When a writer chooses the word order in the middle of the lines of the poem, it means that he will use a letter within the words to create a new word for the acrostic poem. The following examples shows the new word “tough” created form the middle letters of the acrostic. Again, you can see the word “tough” spelled out in the poem. When a writer chooses the word order at the end of the poem, it means that he will use a letter at the end of the words to create a new word for the acrostic poem. Here is an example of a double acrostic, where the first and last letter spell out the word Stroud, a town in England. Double acrostic poems are more complicated and difficult than single acrostics, but the above example acrostic illustrates how an ending word order acrostic can work. An acrostic poem is a type of word play. Consequently, the writer creates an acrostic poem in order to be somewhat cheeky or to show some ingenuity. The new word the acrostic poem creates should be a commentary on the subject itself. That is, the writer selects a particular theme for his poem. Perhaps he chooses the word he wants the acrostic to form first. Then, he writes around that word. The words and lines that make up the poem should tie into the newly formed word. Looking at the above “snake” example, the poem itself is a commentary about snakes. What makes it particularly cheeky is the fact that the poet does not reveal whether it is about actual, physical snakes or people being described as snakes. Additionally, the terms in the “snake” example actually describe what snakes might do. Acrostic poems are a great introduction to diction, poetry, and word play. As a result, many young English students begin their poetry writing practice by creating acrostic poems. Acrostics can be very short (one word per line), or longer and more complex. Some well-known poets have created more complex acrostics. The following is an example acrostic from Lewis Carroll. In this poem, Carroll spells the names of the “little maidens” to whom he is referring. Those names are LORINA, ALICE, and EDITH. Summary: What Are Acrostic Poems? Define acrostic poem: the definition of an acrostic poem is a poem or word puzzle in which certain letters in each line for a word or words. The new word that is crated form the acrostic should connect to the theme of the poem itself. 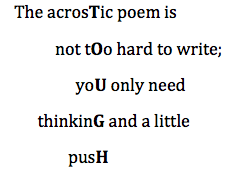 1 What is an Acrostic Poem? 8 Summary: What Are Acrostic Poems?